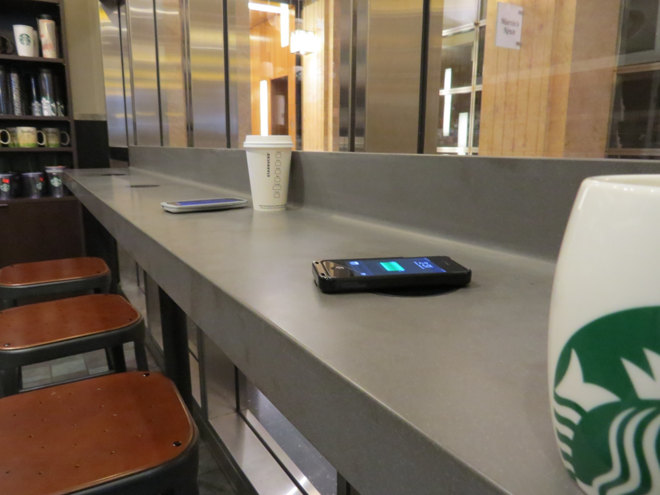 Mega coffee chain Starbucks on Thursday announced a new partnership with Duracell that will see wireless charging stations based on the latter's Powermat technology rolled out to every Starbucks and Teavana location in the U.S. over the next two years. Starbucks will equip its San Francisco locations with Powermat stations this year, expanding to "additional major markets" and Teavana outlets in 2015. The company did not offer a time frame to complete the national rollout, but did say that pilots in Europe and Asia would begin later this year. The coffee chain plans to utilize some 100,000 Powermats at its approximately 7,500 locations once the rollout is finished. "We were pleased with the customer response to the pilot tests, and we're now expanding this offering nationally to provide our customers a quality and reliable experience as they use our stores as their respite, their office away from home or as a gathering place with their friends and family," Starbucks executive Adam Brotman said in a release. The move represents perhaps the largest-ever rollout of wireless charging stations, though the choice of technologies is somewhat odd. Very few devices support Powermat, with most manufacturers siding instead with the competing Qi standard for wireless power solutions.